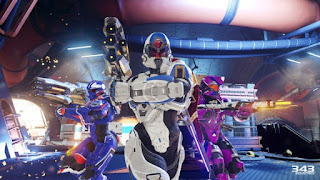 Warzone Firefight is an ambitious new multiplayer experience that takes the initial promise of Halo 5’s Warzone multiplayer – the epic battles, incredible scale and huge maps – and applies that to create the biggest Halo cooperative experience ever in franchise history. In Warzone Firefight, up to eight players will work together to complete five rounds of increasingly difficult, dynamic objectives set against a timer to emerge victorious. Warzone Firefight will feature more enemies than ever – including a brand new tier of “Mythic” enemy bosses. Thought the Warden Eternal was menacing? You ain’t seen nothing yet. Warzone Firefight features the most on-screen enemies in the history of the franchise, making for frantic and exhilarating matches. Of course, it wouldn’t be Warzone without the REQ System, and fans will be happy to hear that you’ll have full access to all of your weapons, vehicles, power-ups, armor mods and more in Warzone Firefight. Standard Assault Rifle not doing its job against a swarm of shielded Jackals? Why not deploy your Scourge of Fire Plasma Caster and melt your opponents? Having trouble against an enemy Banshee? Take to the skies in your own Phaeton! In Warzone Firefight, it won’t be enemy players that give you pause – it’ll be the hordes of angry Grunts. Warzone Firefight is sure to be a fan favorite and Xbox can’t wait to team up and try it out themselves. With dynamic objectives making each game different, you can play thousands of matches before seeing the same objective combination. The prospect of teaming up with seven other players to take on a plethora of enemies using the REQ System has us all eagerly awaiting the release of Warzone Firefight this summer. Be sure to stay tuned to Halo Waypoint, Xbox Wire and follow the official Halo Twitter for all the latest Halo 5: Guardians Warzone Firefight news.